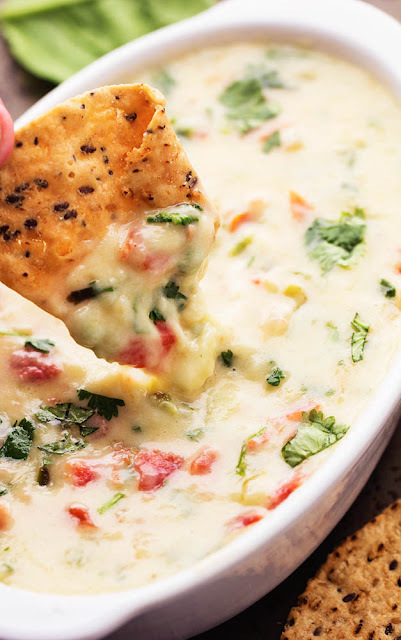 One of my favorite dips on the blog is this Chili’s Queso Dip. We recently visited Chili’s and they had a new dip on the menu. White Spinach Queso. Oh my heavens. It instantly became a new favorite with the first bite. I had to make it at home for our family. We had a little get together this past weekend and I knew that it had to be made. This dip comes together easily. 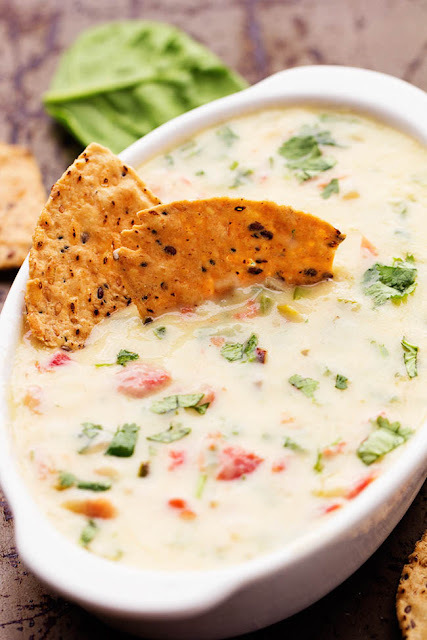 White cheddar and pepper jack cheese, jalapeños, diced tomatoes, and spinach all come together in this flavorful and cheesy dip. Before you know it, it is melted and ready for you to dip your chip into. This is the best dip that you will make. I just couldn’t get enough of it. One chip turned into two and two turned into a million. I seriously could have eaten this entire dip myself! This is a must make dip and perfect for the upcoming football season. You are going to love it! Melty white cheese, spinach, jalapeños, and diced tomatoes come together in this incredible dip! This is a must make dip that you won't be able to get enough of! In a large skillet, heat the oil over medium heat. Add the onion and jalapeño and salute until tender. Add the cheese and half and half and continue stirring until melted. Add the canned tomatoes, spinach and cilantro and stir well. Transfer to a serving dish and serve with tortilla chips. 0 Response to "WHITE SPINACH QUESO"